film and animation – Page 8 – Everything is Oll Korrect! I’ve been in a bit of a nostalgic mood lately, looking back at my experience with anime and reminiscing on my development as a fan. So, I thought it may be interesting to start a series of posts outlining that evolution. Yesterday, I watched Jurassic Park for the first time in a solid twelve years or so. It was a favourite film of mine as a child, and also one of my family’s the most memorable theatre moments, at least for my parents. Little five-year-old me was apparently so terrified I almost crawled over the back of the seat, but I still got my parents to take me to see it multiple times after that (they’d learned their lesson, though, and we sat in the back row on future visits). On VHS, I watched the film constantly, bought lots of the toys, and overall it was a defining film for my childhood. So, when it came out on glorious blu-ray, I had to watch it again. I did have some apprehension, though – often, things I liked as a child don’t stand up to an adult’s more refined taste. Luckily, Jurassic Park stood the test of time brilliantly, and I found I still love this film. I still get excited at the sight of dinosaurs, and I found that I appreciate the film more than I did as a child. Things I didn’t care about then, like character motivations or plot structure, impressed me this go-around. For exmple, I didn’t used to really understand, or care, why the guests were brought to the island, that Malcolm occasionally hit on Sattler, that Muldoon seems obsessed with the raptors, etc. On the downside, I also noticed a few flaws, but they were mostly minor things. For one thing, genetics does not work that way! Also, that tyrannosaur really gets around. He shows up seemingly out of the blue during the stampede scene, and again during the finale comes out of nowhere indoors to surprise the raptors. How did neither the raptors nor the humans notice a giant tyrannosaur coming in through the back door? Were tyrannosaurs stealth hunters? The CIA needs to get in touch with that thing! The film looks great on blu-ray, and the special effects still impressed me. It helps that many of the dinosaurs were animatronic, rather than computer animated. I’m far from the first to say this, but most films just look a lot better when there actually is something in front of the camera. That’s the three-word version of my review of The Mystic Archives of Dantalian. To expand a bit, I did actually enjoy the anime, though that makes the disappointment of the last episode worse. To start with the good, though, the art was well-done, the animation fluid (a few static scenes excepted), and the music was excellent. I really liked the opening and ending sequences. Others have described the show’s atmosphere as its strongest point, and I agree. Edgar Allan Poe would probably approve. Really, all I wanted going in was Gosick with a better plot, and that’s what the first episode or two seemed to promise. A similar atmosphere but with an adult, competent protagonist in Hugh Anthony Disward and a more tolerable tsundere (or whatever word you want to use) in Dalian. Add an interesting premise with the phantom books, and as long as the writers come up with a competent plot, we have an excellent series. Unfortunately, the plot’s the problem. Up to the last episode, Dantalian‘s main problem was simply that it didn’t really go anywhere. Gainax took an episodic approach, which is fine, and most episodes held my interest, though there were a couple serious missteps. In episode three, for example, there’s a half-episode story about a group of children exposed to the phantom book The Book of Wisdom, which turns them into a bunch of geniuses. Their teacher (who gave them the book originally) leads Hugh and Dalian to a shed where they’re all hanging out discussing philosophy and politics and such, and they tell our brave heroes that they plan… not to do anything. Because plotting to take over the world or whatever would be futile or pointless or something. So, they’ll just continue to hang out and keep to themselves. I guess that episode did subvert my expectations, but it hardly makes for a satisfying story and is the most flagrant example of episodes that fail to progress anything. Again, though, most episodes are good enough to at least make Dantalian a B-level endeavour. That is, until the finale. In episode eleven, we briefly meet the Red Biblioprincess Raziel and her keykeeper, who’s just called the Professor. In the twelfth and final episode, they plan to create a zombie army in London by using newspapers as phantom books to turn the readers into zombies. Several problems come to mind. First of all, the whole idea seems silly and rather cliché. Second, they’re assuming everyone or almost everyone in London will read their newspaper. Third, what’s their motive? I don’t have a clue, and here’s where the episodic approach falls apart. This story arc really needed at least a couple episodes to develop. Fourth problem, there’s a small flaw in the plan. As one NicoNico commenter sarcastically despaired, “If only newspaper could be easily destroyed by fire or liquid…” As it turns out, Hal and Flamberge, another keykeeper/biblioprincess duo, show up and do destroy the newspapers with fire. These two had an entire episode (ep. six) devoted to them, but that was all we’d seen of them so far, so their appearance (and quick disappearance) seems almost random. As for the Professor and Raziel, after seeing their newspapers burn they just give up and go home in about as bad an anticlimax as I’ve seen, on par with the genius kids from episode three. We also get more of the Madokami look-alike, but honestly Gainax lost me if they ever explained what place she’s in, what relationship it has with the real world, or who she is. Hugh also gets to have an Evangelion moment (think Shinji sitting on a chair introspecting). All that said, I’d still probably buy a Blu-Ray release, if it comes out in the US. It’s pretty enough to look at to justify that. 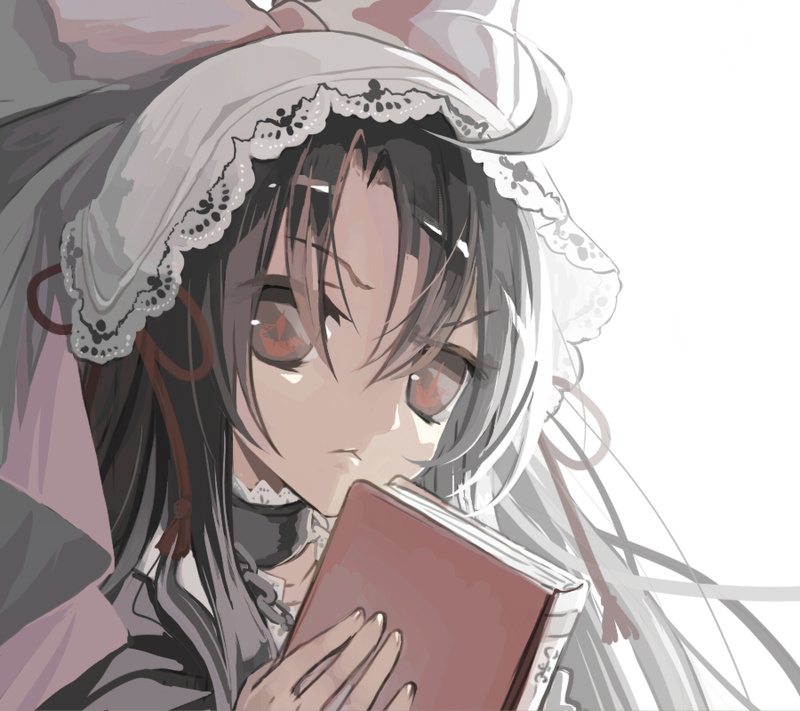 I’d also be willing to try out the light novels the show’s based on. 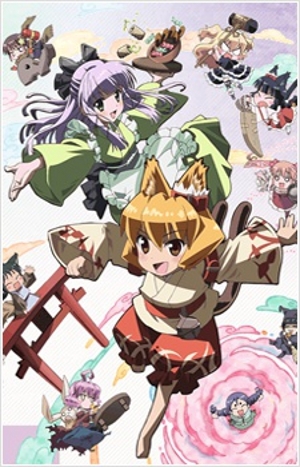 For now, though, it’s time to start on the new anime season (oh yeah, and I was one of the proud few who finished and enjoyed Cat God, but I doubt that’d be worth a separate review). I spent this past weekend at A-Kon, one of two anime conventions held in the Dallas area and the longest-running convention in the US (AFAIK). I had fun spending time with my sister and meeting with a couple friends, which is typically the highlight of any convention anyway, and also went to a pretty good panel on Kon Satoshi given by Helen McCarthy and Daniel Briscoe, but honestly I probably won’t go next year. Though A-Kon isn’t too bad, I just don’t enjoy it as much as I used to. For one thing, the novelty has simply worn off, I can get much of the stuff in the Dealer’s Room online, and most of the art in the Artists’ Alley isn’t worth buying. Most importantly for me, though, A-Kon just doesn’t bring in guests that I care about. I marathon’d Haruhi season two’s ‘Endless Eight’ arc yesterday with my sister. The first time I watched E8, it was through fansubs uploaded to Youtube, and the highlight was really just watching the comments get increasingly irate with every episode. Similarly, the highlight of watching the official DVD release was the commentary reel my sister and I provided. Like many fans, I’m still not sure what to make of the whole endeavour. The studio, Kyoto Animation, put too much effort in the animation for this to be a mere instance of laziness, or even a deliberate lowering of expectations for the upcoming Haruhi film as a bold few have suggested. Some fans, my sister included, did enjoy noting all the differences between each episode, and E8 could be viewed as an experiment in how many different ways one could animate the same events. Using a flagship franchise like this for experimentation, though, seems like a tremendously ballsy move. I finally got hold of the long-awaited blu-ray edition of FLCL, which is second only to serial experiments lain among my favourite (and most-watched) anime. Just owning the whole series gives me sufficient cause to celebrate, since I only own vols. 1 and 3 of the previous release (plus the full series as a bootleg). I’ve read that the Japanese edition had serious problems with video quality, so North American publisher Funimation did their own remastering. The end result looks very good. There were moments when lines became noticeably jagged or the screen looked a bit fuzzy, so one could easily tell that this show came out before HDTVs were common, but I think they do look better than the original DVD release. If you already have the old DVDs and aren’t a big fan, though, it’s probably not worth the purchase. I finished the anime Ghost Hound last night, which an acquaintance of mine recommended to me a while back. Apparently, some of the same staff who worked on serial experiments lain, which I loved, also worked on Ghost Hound, including writer Konaka Chiaki. The resemblance was obvious, too, since both tackle similar themes and share some stylistic touches (like extreme close-ups of people’s eyes or mouth). Overall, it’s an excellent series. Good animation, likable characters, skillful plotting, all the things one checks for. The ending should ideally have been two episodes instead of one, since it felt rushed and everything turned out unbelievably hunky-dory. Overall, though, I felt satisfied.